Where is Spear Hunting Legal? One of my favorite picks for boar hunting is Cold Steel’s boar hunting spear. It’s specifically designed for boar hunting, as evidenced by the name, and serves its purpose well. I know many people use spears for hunting boar since it’s a more attractive option than getting up close and personal using a knife. 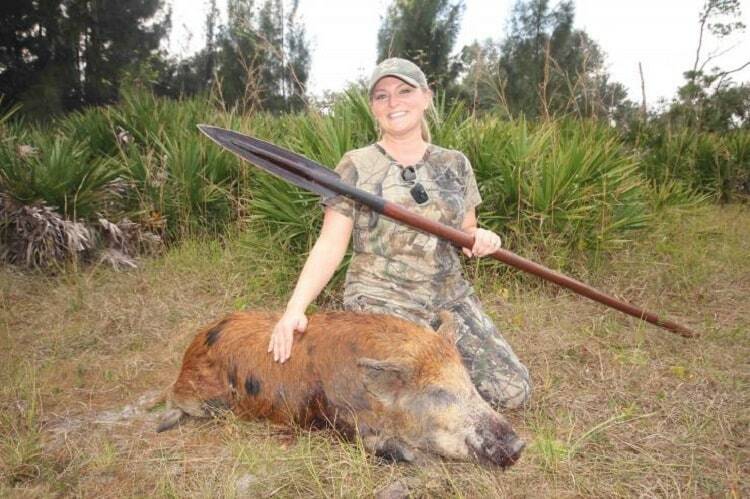 The fellow in the video above is using this spear to take down decent size hogs. Cold Steel’s boar spear has everything you’ll need for a sturdy and safe hunting spear. This spear’s head is 18-1/2” long, 3” wide, and sports a thickness of 3/32”. Forged medium carbon steel makes the spear head more flexible and less likely to break than more brittle steels. The handle socket starts at 1.5” and tapers down to about 1” near the end. Cold Steel ships these spear heads practically scalpel sharp out the box, making it a very effective choice for causing debilitating damage to any game. The handle gives this spear a total length of 82-1/2”, or roughly 6 feet 10 inches long. It’s crafted from American ash wood that gives is a good weight and makes a very strong handle. Given its length of a little under seven feet, it only weights 4.25 lbs, meaning you can throw it a decent distance if needed. Cold steel also includes a secure-ex form fitted sheath that buckles around the head. Smart move given how sharp and deadly this spear is. This spear is perfect for buffalo and hog hunters who want a long reach with a very sharp head that can take out large game without much of a struggle. It’s the perfect alternative to carrying a knife and going face-to-face with a big hog that could hurt you. Instead, you can use this spear’s great reach to touch it from far away and safely dispatch game without having to risk life and limb. Be prepared to use it double as a walking stick and spear, as reaches nearly seven feet long to give you great range and damage potential. 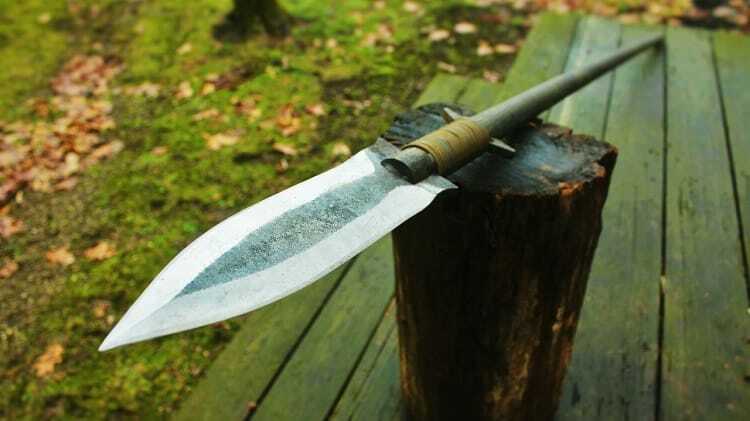 Another great choice for spear hunting is United Cutler’s M48 Talon Survival Spear. This spear uses a great mix of composite materials and a powerful stainless-steel head to make compact spear you can carry on the back of your pack in case you run into trouble with a hog or coyote. If you want a spear that’s lighter and shorter than Cold Steel’s Boar Spear, you may want to stick around for this review. The M48 Talon Survival Spear sports an 8” long head that is 1-1/2” wide and made with 2Cr13 stainless steel for good strength and corrosion resistance. Its total length is 44-1/8” long, meaning it’s a short spear. Its handle is 30% fiberglass reinforced nylon, making it harder to break while keeping it lightweight for easy carrying and throwing over fair distances. There’s a grip point beneath the handle with molded finger grips for a solid grip near the spear head. The whole spear weighs roughly 2.5 lbs, making it easy to carry and throw. Torx bolts make a solid connection between the head socket and handles, making it unlikely you’ll ever have any issues with a secure connection between the two. This spear also comes with a TRP rubber snap on sheath that protects the blade from damage as well as your other gear and yourself from being cut up by the spear. The M48 Talon Survival Spear is for hunters who need a smaller and more compact hunting spear they can easily carry on their rucksack. Despite it being a short spear, it still has plenty of power to take down buffalo, hogs, deer, coyote, and smaller game. I’ve heard many who vouch for this spear as a hog hunting tool that’s worth carrying, even as a backup weapon to avoid going hand-to-boar using only a knife. My personal favorite on this list is the Cold Steel Assegai Short Spear. The compact size, huge spear head, and lightweight make it an excellent choice for prospective spear hunters to get into the hobby without a high price tag. Picking up one of these is a sure way to get started whether you’re after, hogs, deer, coyote, racoon, rabbit, and more. It’s very versatile and easy to carry around as both as main weapon and backup close range weapon. The Assegai Spear has a 13-1/3” long head with a 2mm thick blade and 2-1/2” wide blade. Cold Steel uses SK5 medium carbon steel for these spear heads, making it bend and return to shape instead of breaking. The spear head comes razor sharp out the box and makes this spear head super deadly. Cold Steel’s Assegai Spear is a true short spear, with a total length of 38”, or just over 3 feet. The stained American ash wood handle provides a sturdy yet lightweight handle great for strong lunges, pokes, and throws. You’ll find this spear to be lightweight as well, coming in at 1.7 lbs. Considering the large spearhead and deadly power, 1.7 lbs is very portable and will be easy to carry in your hand or on your pack. Also included with this spear is a secure-ex form fitted Kydex sheath. This protects the blade from damage and prevents it from marring any of your gear or causing accidental injury. Thisis great for anyone who needs a short spear that can take on the largest of game while still being lightweight, portable and durable. Being only 1.7 lbs and 38” inches long, it’s easy to carry on the back of a rucksack as a backup spear in case you run too close to a hog. If you’re wanting to carry multiple spears for buffalo or hog as your main weapon, you can also benefit from this spear. You’ll be able to carry one in your hand and multiple on your pack since they’re lightweight and short, meaning they won’t restrict your ability to move across terrain too much. The budget price makes it a smart choice to pick up two or three at a time, so you can strap them on your rucksack and be ready for any situation. I strongly recommend it for those who want a short spear that can hold its on and much, much more. Condor Tool & Knife’s Yari Spear is a great long spear and alternative to the Cold Steel Boar spear. This spear works out to be roughly 18 inches shorter than the Boar spear, making it viable as a long spear without the nearly 7 feet length that can make it cumbersome. Instead, the Yari spear is around 5 feet in length but still has enough reach and muscle to take down large game. Starting with the head of the Yari spear, it’s packing plenty of muscle. At 14-1/2” long, 2.5mm thick, and roughly 3” across, this blade is a monster to be reckoned with. If you ever want to replace the spearhead’s handle, the socket starts at 1” and tapers into the socket. To add its size, it also comes razor sharp out the box. Rust is kept away by the epoxy black powder coating on the blade that offers a sealed finish over the metal and prevents it from corroding. A sharp blade isn’t useful without a proper steel to keep it in top shape. The Yari spearhead is made from 1075 carbon steel that will hold an edge through long periods of use and abuse. 1075 carbon steel offers a good balance of durability and hardness that is great for spearheads. The Yari spear comes with an overall length of 64-1/2”, giving it a good reach for hog hunting. This length is also great for throwing, given the added paracord handle in the middle which gives a better grip. To keep the sharp blade protected from damage, and to keep yourself the same, this spear also comes with a handcrafted leather sheath. It’s a nice touch that I think is essential for a spear this sharp. Condor Tool & Knife Co.’s Yari spear is a great choice for a long spear you can hunt with. It’s sharp spear head has plenty of muscle needed to take down boars and buffalo if you’re daring. The burnt American ash handle gives this spear a nice balance, and the paracord handle provides a great grip for throwing and thrusting. Plan on using this spear double as a walking stick if you go out on a hunting trip with it, as it’s 64-1/2” total length gives it plenty of reach but likely won’t allow you to carry it on your back. Despite being primitive, spear hunting is effective. Nowadays, many look to spear hunting for a thrill and rush that isn’t brought by any other kind. Using a spear to bring down a wild animal is as primitive as it gets. Just look at this video of a man hunting buffalo with a spear. Tell me this doesn’t look exciting. Practically any game can be hunted with spears, including buffalo, bear, boar, elk, deer, rabbit, raccoon, and more. I’m going to show you my top picks for the best hunting spear. Wielding any of these hunting weapons will allow you to partake in the adrenaline filled rush that comes with spear hunting. If you’re on the mark, you’ll nab yourself some big game and full belly for times to come. There’s a few things to know before you take a spear out into the field for a hunt. Keep reading to find out everything you should know before you go spear hunting. If you’re short on time, I’ve put together a list of the best hunting spears below. The best hunting spear for one person may not be the same for you. Different people have different needs, shocking right? Depending on what type of game you choose to hunt and how far you must travel, you may find you need a specific spear to fit your needs best. If you’re spear hunting bear, buffalo, boar, or coyote, you’ll likely want a spear with plenty of reach a broad head that can do plenty of damage. If you’re after deer, raccoons, or smaller game, you might not depend on your spear as a backup weapon, but instead as your main hunting weapon you choose as a challenge. You can’t spear hunt just anywhere. It’s important that you know the laws and regulations regarding spear hunting in your area. You can’t go around like a wild caveman throwing spears at anything that moves. You should touch up on your local laws regarding which game you can spear hunt.